ナヴァラトナ 幸運 or 不幸の指輪？- navaratna lucky or unlucky ring? Navaratna – Lucky or Unlucky Ring? This one is sort of in a similar vain to my last blog and it is about a gem stone ring with supernatural (?) power. About 6 years ago, I found a very unusual ring at a jewellery shop in <?xml:namespace prefix = st1 ns = "urn:schemas-microsoft-com:office:smarttags" />India and fell in love with it. Needless to say, I bought the ring without hesitation. This sterling silver ring was square shaped and set with nine gem stones. This type of ring is called “Navaratna” ring and it means nine gems in Sanskrit. Ruby which symbolises the Sun is always in the centre. Diamond which symbolises Venus is set directly above ruby. From there in a clockwise direction, pearl for the Moon, coral for Mars, hessonite for Rahu (the ascending node of the Moon or Dragon’s Head), blue sapphire for Saturn, cat’s eye for Ketu (the descending node of the Moon or Dragon’s Tail), yellow sapphire for Jupiter and finally, emerald for Mercury, and they are all surrounding ruby. “Navaratna” has a strong association with the “Navagraha” or “nine influencers (planets) of human destiny “in Vedic Astrology. 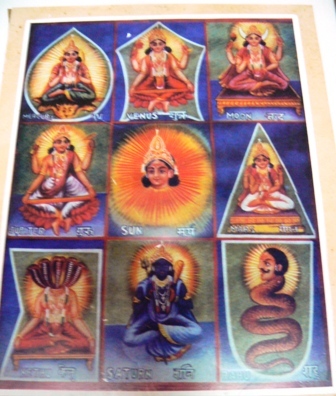 These nine so called influencers (planets) are one and the same planets symbolised by nine gems. 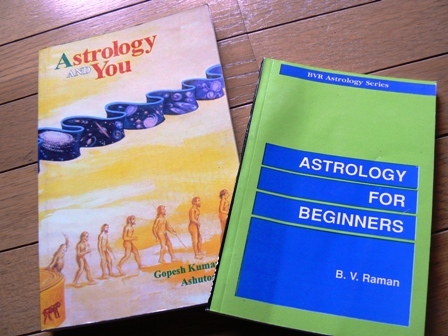 By the way, the term “planet” used in Vedic Astrology is somewhat forced as they include the Sun & the Moon as well as two imaginary points of orbits of the Earth and the Moon – Rahu and Ketu. Anyway, according to the astrology, the placement of the Navagraha in one’s horoscope allegedly has an influence throughout an individual’s life. Wearing the nine gems is said to provide an astrological balance and benefit to the wearer. Vedic Astrologer, however, says that these gems potentially may have either positive or negative influences on human life. Well, as I wrote in the beginning, I purchased a “Navaratna” ring in India about 6 years ago. Unfortunately, the ring was much too big for me and it didn’t fit any of my fingers. My ex-landlady’s daughter, a lovely Indian girl, knew a jeweller and kindly offered to take the ring there to make it smaller. A few days later, she returned the ring to me without any alteration done. I noticed that something was wrong straight away. She was in a state - looked extremely upset and agitated. Anyway, she started blubbering how misfortune after misfortune fell on her because of the ring! She said that after I left the ring with her, she put it on her finger. During the night, she woke up thirsty. Without bothering to switch on the light, she padded down bare feet to the kitchen to get a glass of water. What happened to her then was that she treaded on a glass that shouldn’t have been left on the floor. Poor girl had her foot injured by the broken glass. The following day, while she was driving, suddenly a person materialised in front of her car crossing the road. The accident was avoided, but she said she almost ran over someone! The near accident upset her immensely so that she decided to go home instead of continuing to her destination. And the final nail in the coffin was that on her return home, she ended up driving into the garage door while she was parking her car. Could they be just coincidence??? Anyway, she was adamant that the ring was unlucky and didn’t want anything to do with it. As you can imagine, the series of misfortune that had befallen her really spooked me. The ring might have been cursed or something! 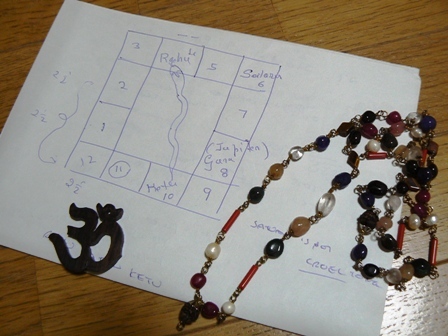 I ended up consulting with a Vedic Astrologer, and it turned out that the ring was in fact unlucky for this Indian girl. So what do you think has happened to the ring? It will be continued to my next blog!